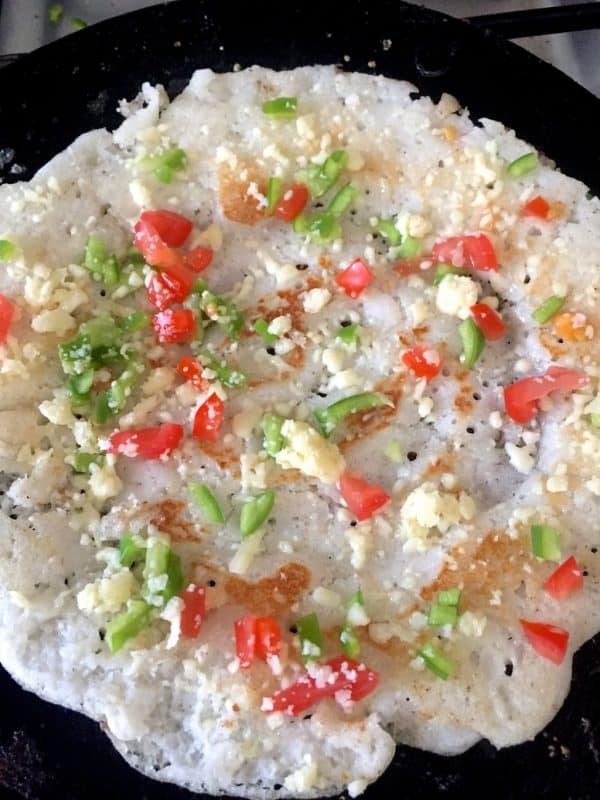 Your breakfast dosa is made more interesting when you add capsicum, tomato, cheese to it. Slice them small and make thin dosas to which you add the stuffing. Or directly add the filling to the batter itself and roll out your hot tasty dosas. Add some basil (fresh if you can get it) to give the Capsicum cheese dosa a distinct and refreshing flavour. Add tomatoes if you wish, diced very small. 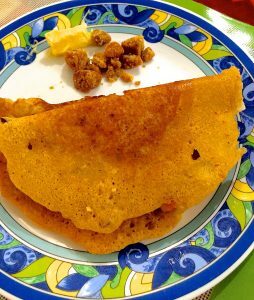 There is a pleasant contrast in textures, with the softness of the dosa and the crunch of the capsicum and tomato juxtaposed with the melted cheese. I use cheddar cheese or good old Amul cheese cubes, cut into little bits. It melts just right while the dosa is getting ready. Or grate the cheese, add a little freshly ground pepper, mix well and use as in the instructions below. 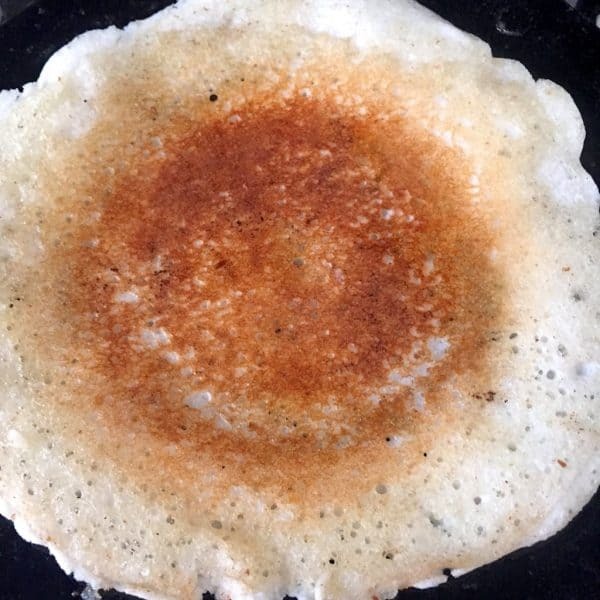 I have made soft dosas which use less oil, however you could make crisp dosas by spreading the batter to a thin round shape. The dosa will cook faster and cheese may be added after one side is done. 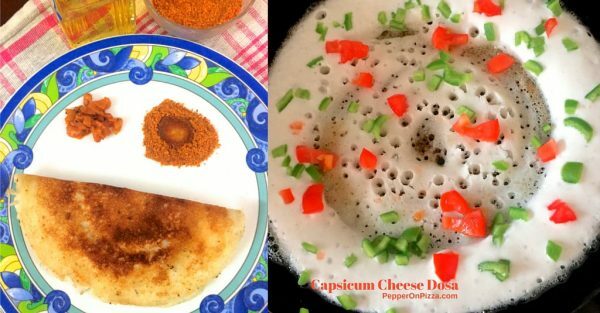 Capsicum Cheese Dosa served with mulagaipodi, butter and chutney has all the makings of a dream breakfast. 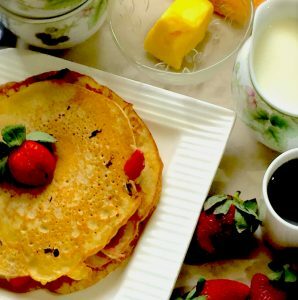 Thin dosas from fresh batter stuffed with diced green capsicum and grated cheese. 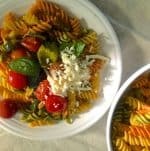 Add tomatoes for variety. Ensure all ingredients are at room temperature. If the batter is cooler than room temperature, it could stick to the pan and not cook well. 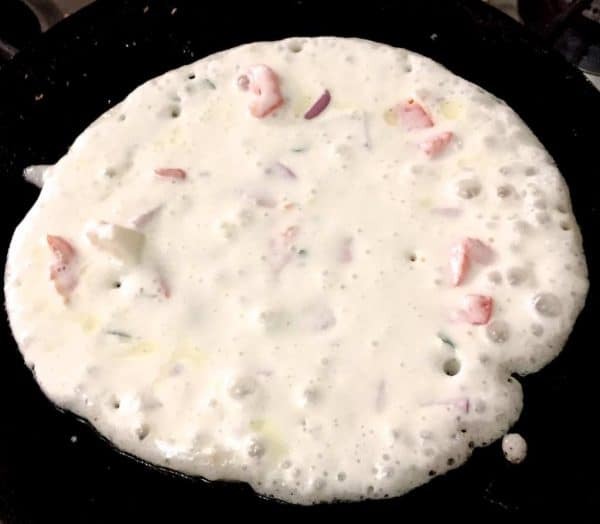 A day old dosa batter is better than a very fresh one. Add salt and mix well into the batter. Add the minced ginger, basil and pieces of capsicum to the batter and mix them in. Add the ground pepper to the grated cheese in a separate bowl, mix well and set aside till you need it. This keeps the pepper crisp, however you could add the mixture to the batter just before pouring, as I have done, mix well and pour as in the instructions below. Dice the green chilli and set aside. Heat the tava ( flat frying pan/ griddle ). I used my well seasoned cast iron tava, however a non stick pan would work as well. Keep the gas on high just till the batter is poured and then lower the flame while the dosa cooks, as in step 6 below. 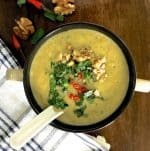 Spread 1/2 tsp of oil on the tava, and pour about one and a half round ladles of batter. Reduce flame to low as you finish pouring the batter. Quickly spread the batter into a round shape, with the back of the ladle. Pour a few drops of oil around the sides of the dosa. 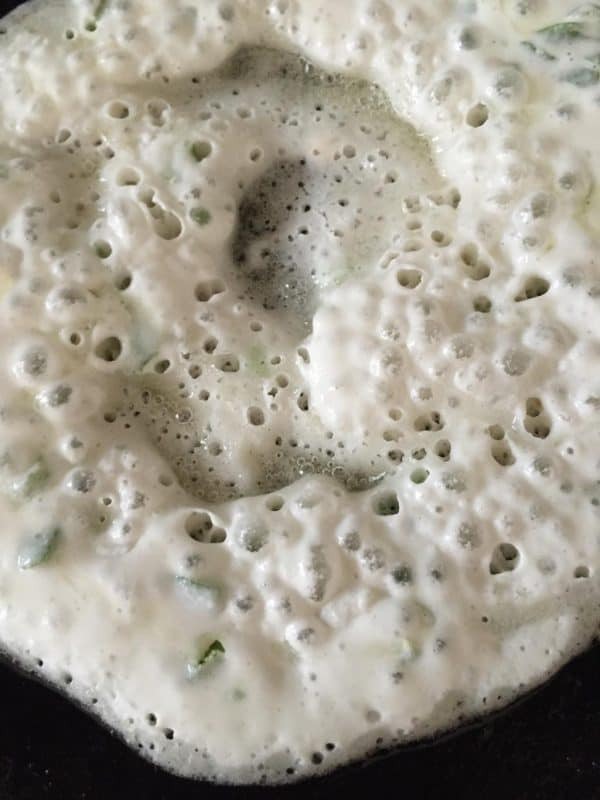 Once the bottom of the dosa begins to brown and there are bubbles all over the top surface, gently flip the dosa. 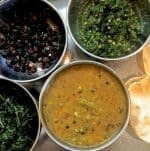 The first dosa generally takes a little more time, say 60 seconds, while the rest get done faster, as the pan gets into the required temperature. Cook for 30 seconds or till the bottom surface is done, and flip again. If you have kept the grated cheese pepper mixture separate, sprinkle it now evenly (or spread pepper cheese spread, if using) on half the dosa surface., as you would do for a quesadilla. Add a piece of green chili. 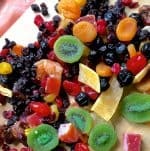 Alternatively, you could add the pepper and cheese mixture to the batter just before pouring, and mix well. In this case, you don't need to sprinkle the mixture on half the surface and fold it, but simply follow all the other steps. Fold the other half on the cheese covered surface. 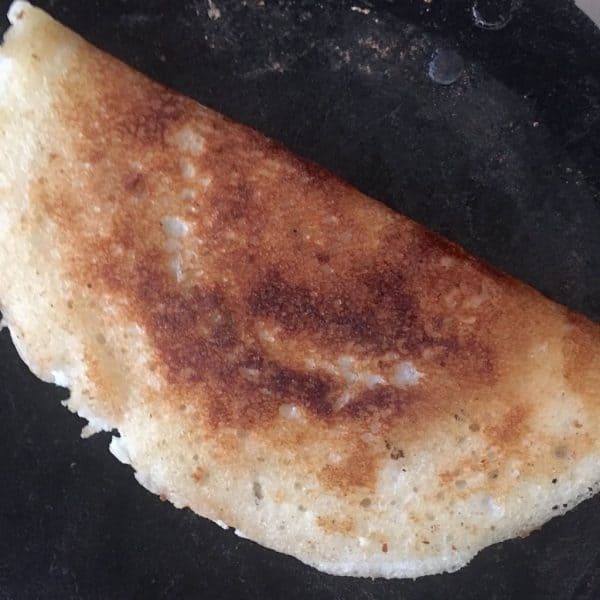 Press down on the folded dosa with the spatula for 10 secs. Gently turnover the folded dosa. Cook for 10 secs and take off from the tava. 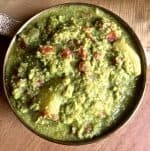 Serve hot with a tomato basil chutney, a coconut chutney or a coriander chutney and mulagaipodi ( idli chilli powder) and a small knob of butter. 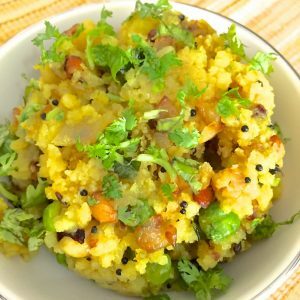 Or serve with mango pickle and mulagaipodi.